I had written more essays in history courses than I had in English or journalism writing classes. I vowed to help her and I gave her a sneak peak of this, the college essay writing article, before it was published. Writing a college essay is a real situation. And unless you’ve been a secretary popping out letters and copy daily, you’re going to feel like an extra-terrestrial that had just settled upon planet Earth. It’s a piece of work. The first thing to do before writing any essay is to figure out what you’re going to write about. Most likely, the professor will assign something or set parameters for your paper. If your professor doesn’t set boundaries, ask him or her to clarify the theme if you’re unsure. I once got a C grade on an essay because I was way off topic; I didn’t give the teacher what he asked for. So take heed. Once you get the writing assignment, brainstorm for the particular points you’d like to make in your essay. Brainstorming doesn’t have to be perfect. The idea is to get your mind going with fresh ideas. My favorite brainstorming technique is “the bubble.” That way, you can get as sloppy as you want. For example, with the following illustration, I started with one word in the center; usually the word is the subject. I then branched out from there. 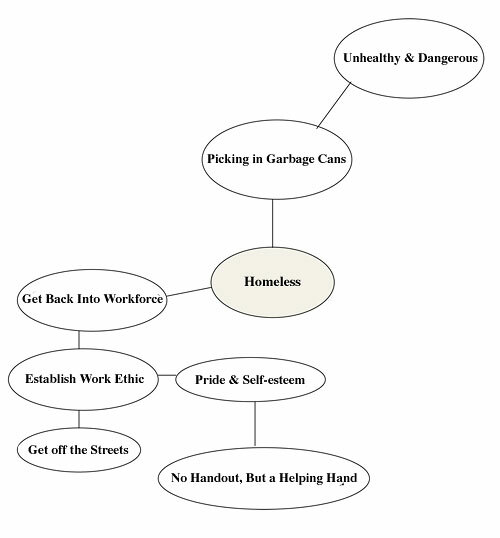 The subject of this bubble is: Should homeless persons work for their food? Within this bubble are all of the points I could think to make in the essay. But believe me, if I had scanned the scribbles (read: chicken scratch) as it were drawn in my notes, you wouldn’t be able to read it. I. Homeless persons picking in garbage cans. Hazardous materials could cause physical harm like used needles, broken glass, etc. II. Get back into the workforce. No handout, a helping hand. You can also simply create a random list of individual words or phrases that comes to mind in writing a college essay. This is called “free association.” With the homeless theme, let’s see how many words or phrases I can come up with from the top of my head: dirty clothing, lice in hair, bath, sleeping on the street, no job, no bills to pay, ultimate freedom, bicycle, cold weather, decent shoes, food, health, nutrition–that’s it! Once you’ve completed your list, scratch out words that you don’t want to write about or that simply don’t make since. You can also combine this technique with the bubble. Grammatically correct sentences should find their way into everyone’s college term papers, but academic language is so 80s. This type of language can leave your essays stiff and inaccessible, even to your professors (okay, probably not them). It can be identified by complicated, polysyllable words when one- or two-syllable words will do. For instance: During days of observance, a multitudinous of patrons procures countless, futile products. Did your mind go smack when you read that? A simplified version of grammar would read: During the holiday season, many shoppers buy scores of useless products. Do you see the difference? * Recommended Reading - Painless Grammar by Rebecca Elliott, Ph.D. – This book goes over the basic rules of grammar, in case you need to brush up on many of them. This book is certainly a mainstay on my bookshelf.